Batting: Tamim Iqbal 103 off 124 balls, Mahmudullah 67* off 49 balls, Mashrafe Mortaza 36 off 25 balls, Shakib Al Hasan 37 off 44 balls. Bowling: Jason Holder 2/55 in 10 overs, David Bishoo 1/42 in 10 overs, Ashley Nurse 2/53 in 10 overs. Target: 302 runs from 50 overs. Bangladesh cross 300 from the last ball of the innings! A superb innings of 67 from 49 balls by Mahmudullah gave them a late boost after Tamim Iqbal’s century set them up well. Can the Windies chase 302 and seal the series? 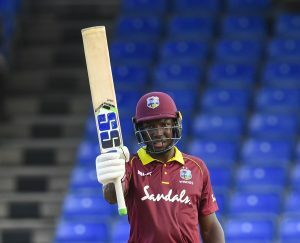 Batting: Chris Gayle 73 off 66 balls, Shai Hope 64 off 94 balls, Shimron Hetmyer 30 off 42 balls, Rovman Powell 74 off 41 balls. Bowling: Masrafe Mortaza 2/63 in 10 overs, Mehidy Hasan 1/45 in 10 overs, Rubel Hossain 1/34 in 7 overs, Mustafizur Rahman 1/63 in 10 overs. Despite a valiant effort from Rovman Powell, who smashed 74 off just 41 balls, Windies fall 18 runs short against Bangladesh, with the latter claiming a first away ODI series win since 2009! Having won one match each of this 3 match ODI series, both teams aimed to win this final ODI and clinch the series. Mashrafe Mortaza chose to bat first because of windy conditions and a short straight boundary. Bangladesh openers, Tamim Iqbal and Anamul Haque walked out to bat. For West Indies, the new ball was shared between Cottrell and Holder. The openers made a slow start; courtesy of some accurate line and lengths from the opening bowlers. In 9 overs, Bangladesh only scored 34 runs. And, in the very next over, an effort to increase the run rate ended Anamul Haque’s innings; courtesy of Jason Holder. Shakib Al Hasan joined Tamim Iqbal. West Indies made a change in their bowling and brought the leg spinner, Bishoo into the attack. However, the pair did not flutter and brought up the 50 run stand between them. Several overs, later Tamim got to yet another half century. Yet another half-century for Tamim Iqbal, his third 50-plus score in succession – what a series he is having! At the halfway stage of the innings, Bangladesh are 116/1. What would be a good score for the Tigers? At this point, Bangladesh had scored 99 runs for the loss of only 1 wicket. Windies needed a wicket and it was provided to them by Nurse. The spinner claimed the wicket of Shakib and broke this 81 run stand. Mushfiqur Rahim joined Tamim Iqbal. The pair added another 36 runs after which Nurse claimed his second wicket in the form of Mushfiqur Rahim. Mahmudullah joined Tamim Iqbal and Bishoo was inducted back into the attack. Tamim Iqbal reached his century as Bangladesh reached a total of 200 runs in 39 overs. 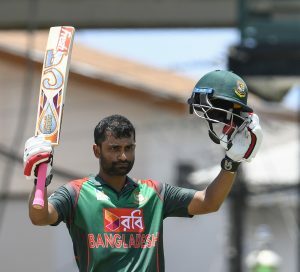 A ninth ODI hundred for Bangladesh legend Tamim Iqbal, and a second in the series. Will it be a match-winning and series-sealing effort? However, in the same over, Tamim perished against Bishoo’s bowling as Windies got their 4th wicket. The Bangladesh captain, Mashrafe Mortaza joined Mahmudullah. The pair added some quick runs and took Bangladesh over 250. 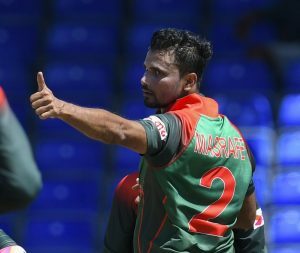 There’s so little confidence in Sabbir Rahman and Mosaddek Hossain, that Mashrafe Mortaza has had to promote himself to No 6, with more than 12 overs remaining in the innings. But, Mashrafe’s cameo came to an end as Holder got his 2nd wicket of the match. Sabbir Rahman joined Mahmudullah who reached his half century, but the pair lasted only lasted 2 overs, after which Sabbir departed off Cottrell’s bowling. Mosaddek joined Mahmuddullah. The pair remained unbeaten till the end as Bangladesh finished strong on 301 runs. 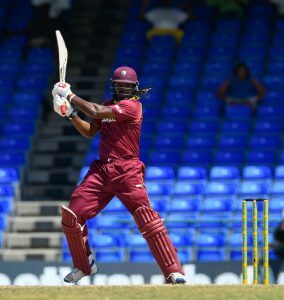 With 302 runs to win from 50 overs, Windies openers, Chris Gayle and Evan Lewis walked out to bat. For Bangladesh, the new ball was shared between Mashrafe Mortaza and Mehidy Hasan. The pair shared an excellent stand of 53 runs in 10 overs, thus denying Bangladesh an early wicket. However, Mashrafe continued with his sixth over and struck on his very first ball by removing Evan Lewis off the crease. Shai Hope joined Chris Gayle. The pair continued the same pattern, as the ‘Universe Boss’ brought up his half century. Soon, the pair brought up their 50 run partnership but Mashrafe’s persistence with Rubel paid off nicely as he departed in the 22nd over. Hetmyer joined Shai Hope and Bangladesh introduced Shakib Al Hasan into the attack. The pair added another 31 runs as Shai Hope got to a very slow half century off 71 balls. This partnership was broken in the very same over as Hetmyer departed off Mehidy’s bowling. 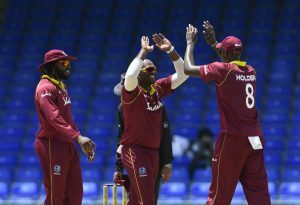 Now with Powell and Hope on the crease, West Indies needed 129 runs to win from 14 overs with 7 wickets in hand. However, this partnership lasted only one over as Keiron Powell got run out in the very next over. Now, Rovman Powell joined Hope. The pair added 45 runs to the total after which Hope departed in the 44th over. Jason Holder joined Rovman Powell. Rovman reached his half century and the pair added another 38 runs after which Holder departed off Mashrafe’s bowling. Now with Nurse and Powell on the crease, Bangladesh needed 78 runs from 41 balls. 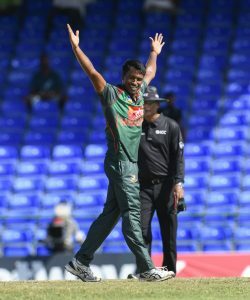 Rovman Powell took the fight to the very last over, but Rubel Hossain and Mustafizur Rahman bowled excellent death overs and Windies lost the match by 18 runs and the series by 2-1. 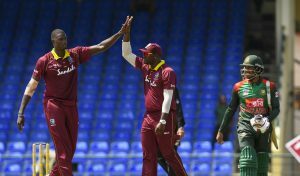 Despite heroic efforts from all-rounder Powell and opener @henrygayle West Indies fail to chase 302 in the final ODI, allowing Bangladesh to win the 3-match series (2-1). A historic moment for Bangladesh to win an ODI series outside Asia. @TamimOfficial28 was again phenomenal. Hard to miss Mashrafe Mortaza. Plays only one format, but Bangladesh does well under him. Wins an ODI series after October 2016, and contributed too. Which, knowing him, matters to him. This is the end of West Indies Vs Bangladesh ODI series. Join allsportspk on 1st August, for the 1st T20 between West Indies Vs Bangladesh.